A spicy dish, from the generous amount of dried chillies and peppercorns. I like it the way it is, spicy! If a moderate or mild spicy taste is preferred, use a lesser amount of both the dried chillies and peppercorns. But if you can take heat pretty well, I urge you to go for it, as the chillies really make the dish! 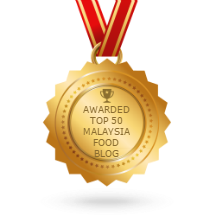 I used more than the amount of dried chillies called for, as I love really spicy dishes. I've used desiccated coconut instead of fresh grated coconut. During simmering, I've added a couple of tablespoons of water at a time, as the dish appears dry. Not too much of water, as the chicken pieces are supposed to be coated with the thick gravy when done. I have omitted the last step with toasted fennel seeds. I'm sure it will be extremely fragrant from the fennel seeds but I was too lazy, maybe the next time. Spicy and delicious dish. Great with white rice. Prepare paste : Heat oil in a wok and fry dried chillies, coriander, peppercorns and cardamom for 5 minutes. Remove and fry shallots, curry leaves, garlic, ginger and grated coconut until shallots brown lightly. Put all paste ingredients except water into a blender. Add water bit by bit and blend mixture until very fine. Heat oil in a wok. Add curry leaves, then onions. Cook until onions are brown. Add paste and fry until fragrant. Add chicken pieces and stir-fry to coat completely. When juice start sizzling, add salt and turmeric powder. Mix well. Add potatoes now if using. Cover wok with a lid and allow chicken to cook gently. Remember to stir occasionally. Cook until sauce is reduced and thickened. Toast fennel, then grind onto a powder using a mortar and pestle. Sprinkle over chicken and serve hot with rice or breads. Theme for August 2018 : Cooking With Spice! This egg curry is quite delicious. 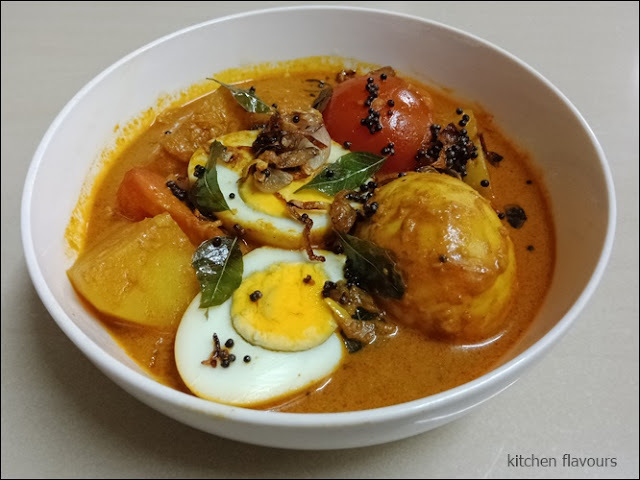 Hard-boiled eggs, potatoes and tomatoes are simmered in a curry sauce with spices ; cinnamon stick, star anise, cardamom pods, curry powder, chilli powder and ground black pepper. When the curry has done cooking and while still simmering, it is topped with some tempered spice. To temper the spice, heat some oil, and fry black mustard seeds, curry leaves and sliced shallots until the shallots brown, then pour over the simmering curry. Delicious with fluffy white rice. Blend garlic and ginger into a paste and set aside. Combine curry paste ingredients and set aside. Heat oil in a pan and stir-fry cinnamon, star anise and a stalk of curry leaves. Add onions and stir-fry to a golden brown. Add garlic-ginger paste and simmer until fragrant before adding curry paste. Cook for 3-5 minutes. Add potatoes, half the tomatoes and water and cook until potatoes are almost done. Add hard-boiled eggs and evaporated milk. Simmer for 15 minutes, then add remaining tomatoes. Meanwhile, heat some oil in a wok. Fry mustard seeds, remaining curry leaves and shallots. When shallots brown, pour over simmering curry. Allow curry to stand for 30 minutes before serving. 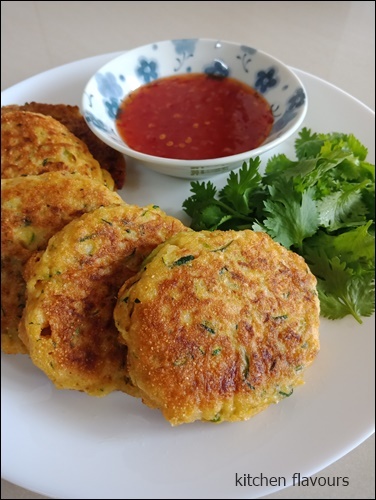 These cake patties are originally served with Mint Chutney and Yoghurt, but I have taken the easier route of serving them with Thai Chilli Sauce instead. The only spice used is a small amount of ground cumin (1/4 tsp) , but I have added more of it. Grated zucchini are mixed with some salt, then let sit for 10 minutes. Squeezed out the juice as much as possible, and there will be a lot of juice. Then mix the squeezed zucchini with the rest of the ingredients as per the recipe instruction. Make 2 tablespoons size balls, place in hot oil, flatten with the back of the ladle and fry until brown on both sides. Drain on absorbent paper towel. 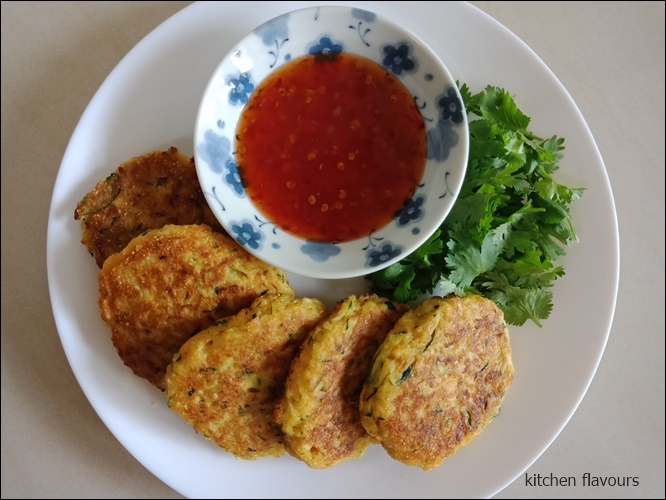 I serve the Zucchini-Cornmeal Cakes with Thai Chilli Sauce and some fresh cilantro. The cornmeal adds an interesting texture. Nice cakes. In a large colander, toss the grated zucchini with 1/2 teaspoon of the salt. Let it sit in the sink (or in a bowl) for 10 minutes to drain. In a large bowl, combine the cornmeal, flour, baking powder, baking soda, cumin, and remaining 1/2 teaspoon salt; mix to combine. In a separate bowl, whisk the eggs with the melted butter. Then add the egg mixture to the cornmeal mixture, whisking to make a thick batter. Squeeze as much of the remaining moisture out of the salted zucchini as possible, and then add the zucchini, scallions, and garlic to the batter; fold everything together gently. In a large skillet over medium heat, add just enough olive oil to coat the bottom of the skillet. When the oil is hot, drop as many 2-tablespoons-sized balls of the zucchini batter into the skillet as you can to form a single layer, without the balls touching. Flatten each one with the back of a metal spoon. Fry until they are deep golden brown, 3 to 4 minutes per side. Transfer the zucchini cakes to a paper-towel-lined plate to drain, sprinkling them with salt to taste while they're still hot. Repeat with remaining batter. These little raisin buns are a regional specialty from northern Germany. The spice used is ground cardamom. According to the author, historically the buns were doused with hot milk and served with spoons. 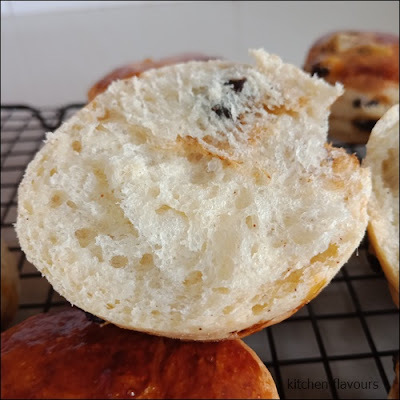 Instead of dividing the dough to make small buns, the dough is rolled out and small rounds are stamped out using a cookie cutter, similar to making a cut-out scone. The little rounds are then left to rise on baking trays. Brush with egg wash ; whisk egg yolk and milk together, then brush it thinly over the tops of the risen buns. This would give the lovely deep bronze colour on the buns when fully baked. Freshly baked with deep bronzed top. Soft, light interior and crisp top crust. 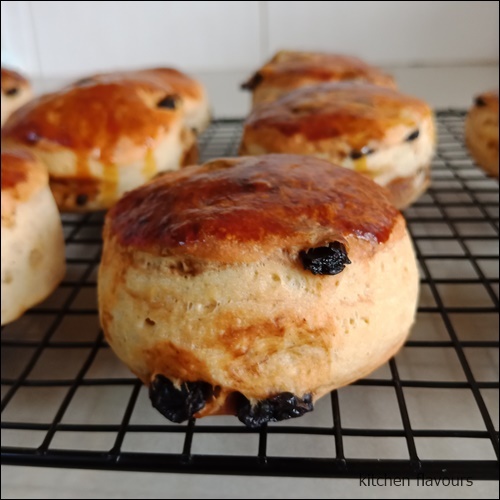 Lovely buns, great with either coffee or tea. Makes a nice breakfast and tea-time snack. To make the dough : Place the flour, yeast, sugar, salt, and cardamom in a large bowl. Add the milk, eggs, and butter, cut into rough chunks. Knead together by hand for a minute or two in the bowl, and then dump out on a lightly floured work surface and knead until smooth and no longer sticky, about 5 minutes. Pat out the dough slightly. Place the raisins and citron peel on top; fold the dough around them and knead until everything has been well distributed. Form the dough into a ball and place in the large bowl. Cover with a clean dishcloth and set in a warm, draft-free spot to rise for 1 hour. 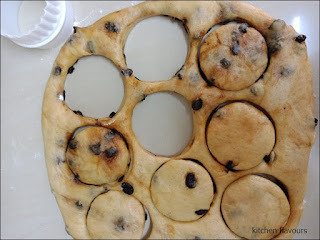 After 1 hour, gently tug the risen dough out of the bowl and onto your work surface. Roll out the dough with a rolling pin until it is 1/2 inch/12mm thick. 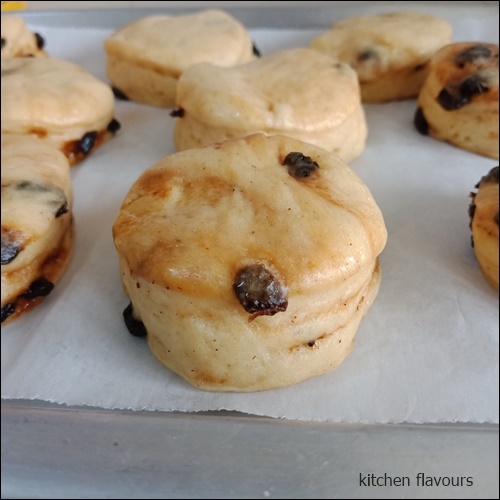 Using a 2.5-inch/6cm round biscuit cutter, cut out rounds of dough and place them on the prepared baking sheet, leaving 1/2 inch/12mm between the buns. Knead together the scraps, roll out again, and stamp out the remaining buns. Preheat the oven to 400F/200C. Cover the buns with the dishcloth and let rise for 20 minutes. To make the egg wash : Whisk together the egg yolk and milk and then brush it thinly over the tops of the risen buns. Place the baking sheet in the oven and bake for 15 minutes. The buns will be deeply bronzed on top. Remove the pan from the oven and let cool on a rack for 10 minutes before removing the buns from the baking sheet. Serve warm or at room temperature. The buns are best the day they are made, but will keep at room temperature for 1 day. 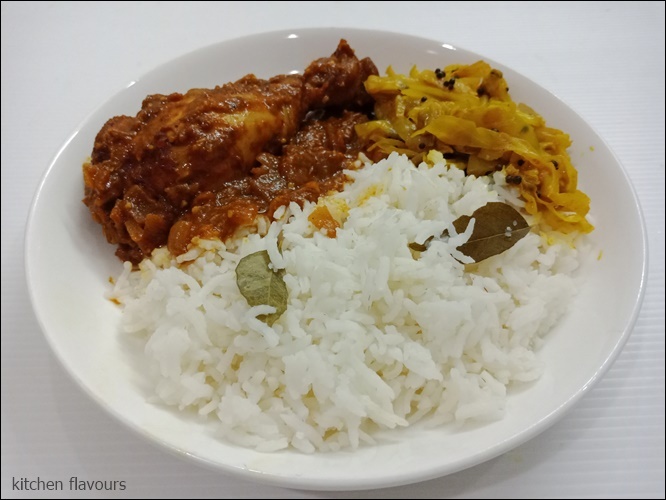 This is Meera Sodha's ultimate comfort food, her Mum's Curry Chicken. 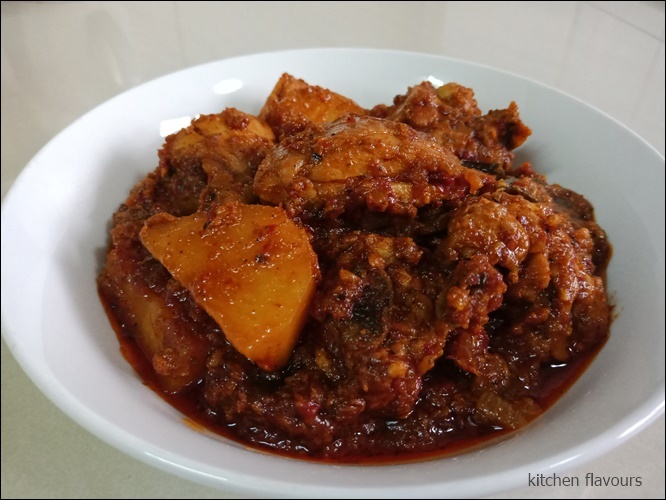 When she left home to go to university, she constantly dream of her mum's curry chicken. Since her mum has taught her how to make it, it has become her favourite dish to share with friends. And I am glad that she has shared it in her lovely cookbook, Made In India. From the list of ingredients, and the amount used, I can see that there would not be much sauce, and since we love sauce, especially any curry sauce, I have doubled the amount of the spice ingredients for the sauce, with the exception of the yoghurt (to taste) and the ground almonds (to taste). We had it for dinner with some basmathi rice cooked with some fresh curry leaves, and a side dish of Simply Spiced Spring Cabbage, from my previous post. A delicious curry dish, one that I would cook again. The full recipe can also be found at Meera Sodha's website. Meanwhile, put the ginger, garlic and green chillies into a pestle and mortar with a pinch of salt and bash to a coarse paste. Add the paste to the pan and cook gently for 2 minutes, then pour in the passata and stir. Cook the passata for a few minutes until it resembles a thick paste, then add the tomato puree, ground cumin, turmeric and 1/2 teaspoon of salt (or to taste). Whisk the yoghurt and add it slowly to the curry. Cook it through until it starts to bubble, then add the chicken. Pop the lid on the pan and continue to cook on a gentle heat for around 30 minutes. Add the ground almonds and the garam masala and cook for another 5 minutes. Serve with a tower of chappatis, hot fluffy naan bread or rice, and offer yoghurt at the table. I have doubled the amount of spices and other ingredients for the sauce with the exception of the yoghurt (to taste) and ground almonds (to taste). The recipe above is the actual recipe from Meera Sodha's website and from her book, adjust accordingly if more sauce is desired. As it is called, this is an easy simply spiced spring cabbage dish. 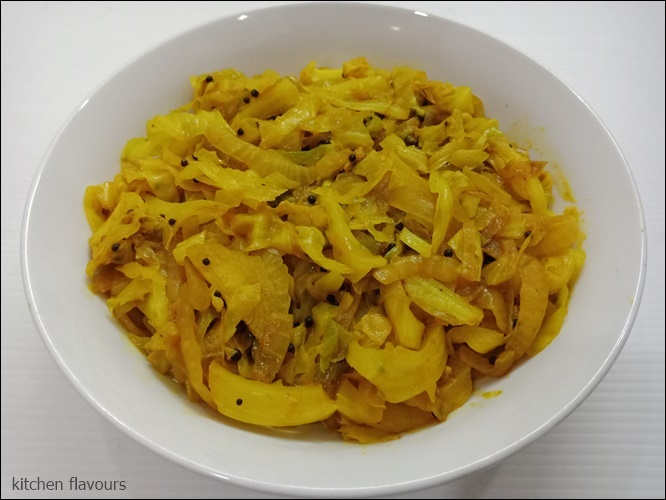 A side dish that is usually served as part of a meal with other main dishes. The author says that for a bit of variation, small cubes of potatoes can be added in. The author suggested that this dish is delicious when eaten with chapatti and yoghurt. 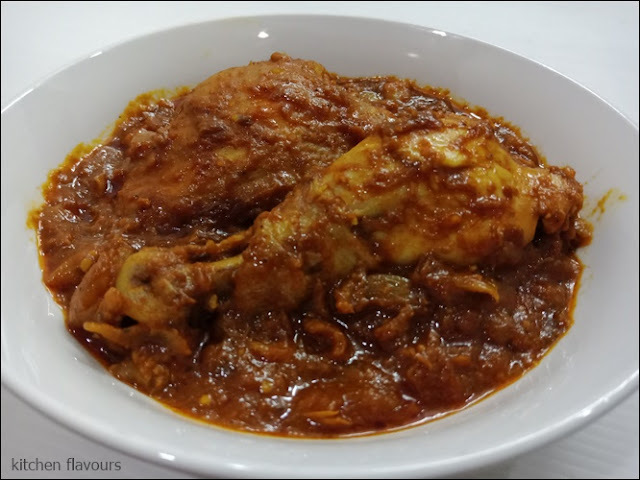 I have however serve it alongside a dish of chicken curry, another recipe of hers, with basmathi rice. Put the oil into a wide-bottomed, lidded frying pan on a medium heat and, when it's hot, add the mustard seeds. When they start to pop, add the onion and fry for around 6 to 8 minutes, until it is nice and soft. Add the shredded cabbage and 50ml of warm water, stir and pop the lid on. Allow to cook through for 5 minutes, then add the turmeric, salt, cumin, chilli powder and tomato puree. Stir, pop the lid on again and cook for another 6 to 8 minutes, until the cabbage is really soft without any crunch left in it. When I first saw this recipe, I was curious about the combination of coffee and cardamom. I love both coffee and cardamom but have never tried them together in a bake before. I'm so glad I did. This cake is a winner! I made half a recipe, using a half-bundt pan. I halved all of the ingredients, except for the sugar, which I've further reduced to 100gm. The cake smells amazing while baking. I skipped the icing as we are not fond of frosting, we prefer our cakes plain. I let the baked cake sit overnight and sliced it the next day. It was moist with soft tender crumbs. A winner! I love the combination of coffee and cardamom, balances really well together. This is one cake that I would make again. 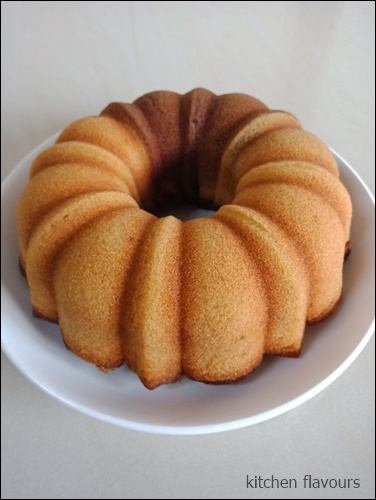 I made half of the recipe and baked in a half-size bundt pan (6-cup capacity). 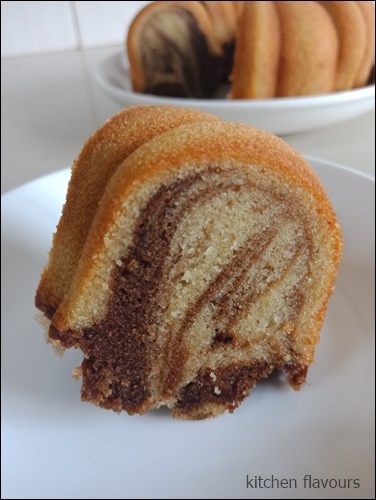 The recipe below is the full recipe to be baked in a 23cm bundt pan. Preheat the oven to 195C/175C Fan/Gas Mark 5. Grease and flour a 23-cm bundt tin and set aside. For the cake : Place the milk, eggs and vanilla extract in a medium bowl and lightly whisk, just to combine. Sift the flours and salt directly into the bowl of an electric mixer with the paddle attachment in place, then add the sugar and mix on a low speed for 30 seconds. Add the butter and half of the egg mixture and continue to mix until the dry ingredients are incorporated. 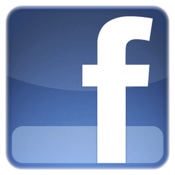 Increase the speed to medium and beat for 1 minute. Scrape down the sides of the bowl. then gradually add the remaining egg mixture, in two batches, making sure the first batch is fully incorporated before adding the next. Don't worry if your batter looks slightly split ; it's due to the large proportion of eggs in the mix, but it won't affect the final result. Scrape down the sides of the bowl and divide the mixture between two bowls. Add the ground cardamom to one bowl and fold to combine. Warm the extra 20ml of milk in a small saucepan, then place in a small bowl with the coffee granules and cocoa powder. Stir until the coffee dissolves and the consistency is that of thick but pourable milk. Combine this with the cake mixture in the second bowl. Spoon the two mixtures into the prepared tin in four alternate blocks, two of each colour, then use a skewer or small knife to make a zigzag-shaped swirl once through the mix, to create a marble effect. Do not be tempted to overdo the swirling as you will lose the effect of the marbling. Bake for 40-45 minutes, or until a skewer inserted into the centre of the cake comes out clean. Remove from the oven and set aside for 10 minutes. The cake tends to dome in the oven, so if this happens and you want a perfectly flat base (the top will become the bottom once it's inverted), just slice off the top to flatten it out before turning the cake out on a wire rack to cool completely. To make the icing : Combine the coffee and warm milk in a small mixing bowl. Add the icing sugar to the coffee mixture, together with the soft butter. Whisk until smooth and thick, then spoon over the cooled cake, so that it drips unevenly down the sides. Allow the icing to set slightly before serving.